The Dakar Rally – 8500km of racing over 12 days, passing through some of the most inhospitable and inaccessible terrain in South America. Not exactly a spectator sport, I thought. But how wrong I was. Following the Dakar on a motorbike is a truly unique spectator experience. No other sport I have watched allows you get so close to the event, to get inside it and really ‘feel’ it. On a motorbike, you don’t watch the Dakar – you live it. The Dakar is so much more than the racing: it is an eclectic community of racers, the organisers, the press, the support crews, spectators, and the locals who live along the race route; it is a travelling town; a sports match spread out over three countries; it is a legend playing out in front of you. To be part of it, even as a spectator, is an adventure, a challenge, an experience like no other. And there is only one way to do it – on two wheels. These were my words after following the 2014 Dakar earlier this year. Even now, reading them generates a sense of excitement. Dakar was, without question, one of the best weeks of my twenty months in South America. In a little over five months from now, Dakar 2015 will roll off the start ramp in Buenos Aires. And this time, one particular factor makes this edition the perfect one to follow on a moto – it starts and finishes in the same place, and what’s more in a city which is one of the most convenient in South America for shipping motos in and out off. This is going to make the logistics for a rider wanting to follow the entire race a lot easier, and probably cheaper. If you’ve dreamed of following the Dakar, next year may be your best chance; it’s the first time in the rally’s history that the start and finish locations coincide, and next year it may revert back to the norm with thousands of kilometres between the two. 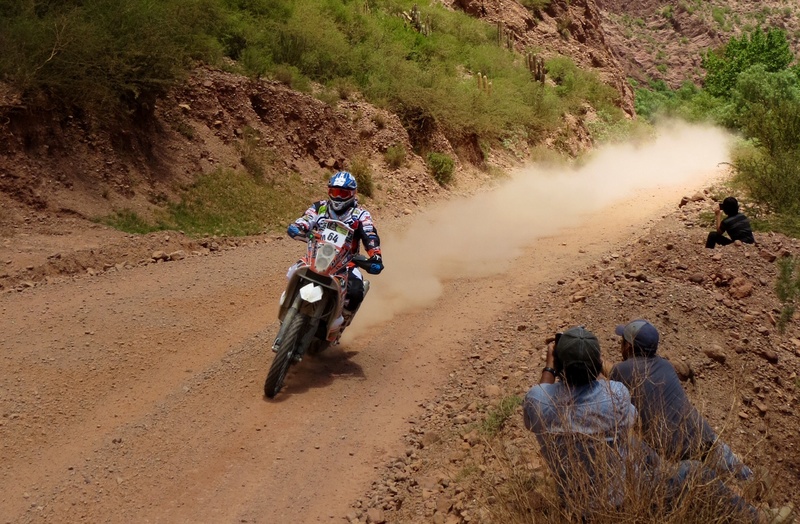 There are three ways to follow the rally on a moto: as a member of an organised tour; hiring a moto in Argentina; or bringing your own machine. Guided tours have obvious advantages – they are easy, with everything organised for you, spare bikes and mechanics on hand, and a chase truck carrying all your gear. But in my mind, ‘easy’ and ‘adventurous’ are mutually exclusive. And such tours aren’t cheap. For me, the true essence of the Dakar experience can only be found when riding independently. Watching Dakar is so much more than riding from one spectator zone to another and then to the hotel. It is ‘the stuff in-between’ that adds the magic: meeting and joining up with fellow riders along the way; trying to evade the police find the best vantage points; getting lost; negotiating borders; not really knowing what the next day will throw up; having the freedom to change your plan at a moments notice to seize an unexpected golden opportunity. I’ve done some research on hiring adventure motos in Buenos Aires. 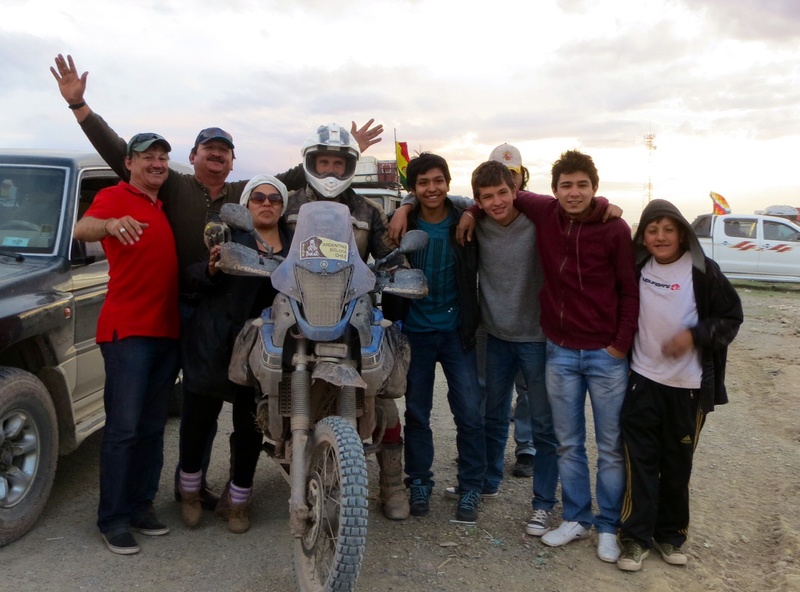 It can be done, and I have been assured that the necessary arrangements to take the bike across the border into Chile and then Bolivia can be made with the rental companies. But I’ve also been advised that if you want to go for this option, you need to get on with it now – leaving it longer will probably mean all the bikes will be reserved. My recommendation would be to bring your own machine. Why? Firstly, I expect the cost of hiring a moto and the cost of bringing your own will be comparible. Secondly, you are going to ride a long way, the riding is going to be the backbone of the trip, and thus you want to enjoy it; a bike you that is set up for you, that you know and more importantly trust, is going to make the experience a much more fruitful one. Perhaps more significantly though, with the start and finish in Buenos Aires, the logistics of bringing your own bike on this occasion are both easy and affordable. For British riders, James Cargo (www.jamescargo.com, ask for Giles) will fly your moto one way from London to Buenos Aires for about £1700 (USD 1900). If, as I did, you enlist the help of Sandra from the coincidentally-named Dakar Motos (www.dakarmotos.com) to clear the bike through Argentinian customs for you, the process will take a morning at most (assuming your paperwork is in order). I rode my Tenere out of Buenos Aires Airport nine days after dropping it off at James Cargo’s depot in Slough. Giles and Sandra routinely work together to coordinate bike shipments, and are very efficient; the process couldn’t be easier. Getting your bike home after the rally will be just as easy, and notably cheaper. Again, leave it to Sandra. She can organise flying your bike to pretty much anywhere. She will need the bike (and you) four working days before you want to send it and will organise everything, from paperwork to packing the bike. It’s difficult to predict the cost of airfreighting from Buenos Aires in January 2015, as the Argentinian economy is a little fluid, but in May this year Sandra gave me an estimate for my XT660Z of 16,200 Arg Pesos. On current exchange rates, that is £1,150, or just shy of US$2000. And with inflation in Argentina around 10%, it will likely get cheaper as time passes. But here is the twist. If you exchange US dollars on the widely-used black market (or ‘Dolar Blue’ as it is known locally) within Argentina, costs drop significantly. At present, you get nearly 50 percent more with the Dolar Blue – but of course the exchange rate is always shifting. Changing US dollars on the black market is easy. I even did it in a small village with the proprietor of the local hotel. (The daily rate appears on various websites and everyone seems to know what it is.) So using the Dolar Blue, flying an XT660Z or a bike of similar weight from Buenos Aires to London might cost less than US$1400. Of course, the financial advantages of the Dolar Blue extends to all your other costs whilst in Argentina – which will be the majority of your four weeks in South America. 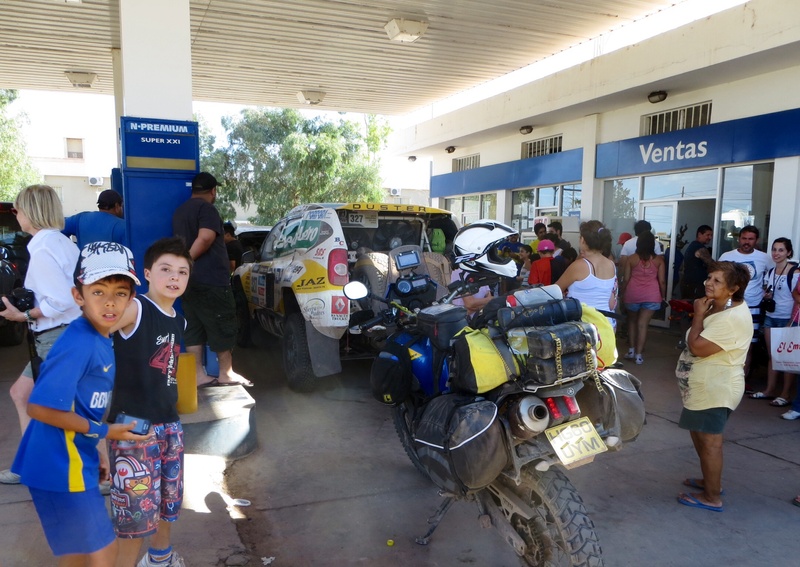 If you don’t want to carry a pannier full of dollars to fund the trip, you can always stock up when the rally enters Chile for the middle section – withdrawing local currency from ATMs and exchanging it into dollars. Costs can be kept down even more by camping. Every town and village in Argentina seems to have a campsite; and frankly, camping when following the rally makes life much easier when things are unpredictable, as they invariably will be. What else do you need to think about? 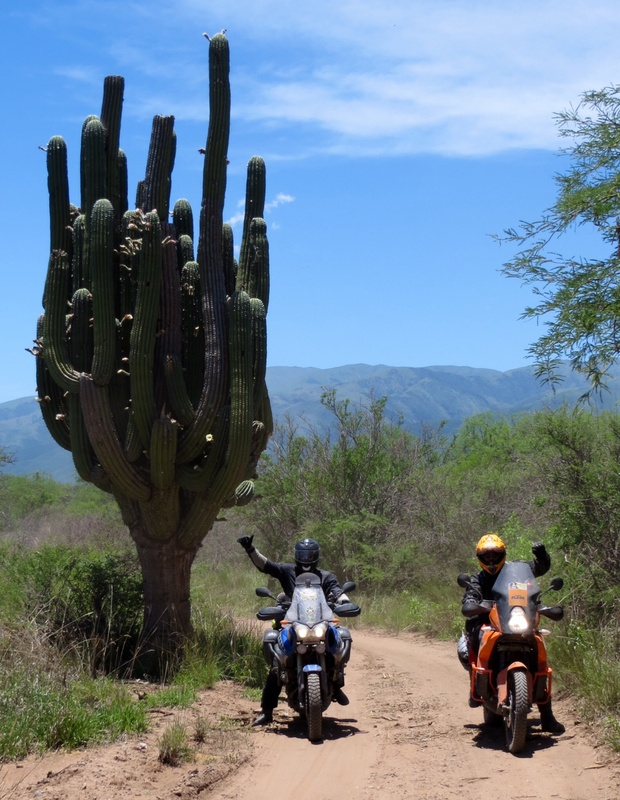 Not much, thankfully, as South America is a very easy place for a motoquero to do his or her business. You don’t need a Carnet for the bike; nor any compulsory vaccinations. Most of us don’t need visas for Argentina, Chile and Bolivia – though US citizens do for Bolivia, purchased at the border on in advance for $135. Sandra at Dakar Motos can sort you out with third party insurance for your moto. And you may want to get a bike-specific travel insurance for yourself from your home country, (but don’t worry about paying a hefty premium to cover off-road riding, as most of the dirt tracks you may use are officially roads, used by locals, and thus a standard insurance should cover it). So get your diaries out…. The race dates are 4-17 January 2015. You will need about a month in total (22 Dec – 23 Jan); the way Christmas and New Year fall in relation to the weekends means there will only be two working days between 24 December and the start of the rally, so plan on collecting your bike before Christmas. And remember, Sandra needs four working days to sort out the return. For the family men amongst you, this may be a hard sell – unless, of course, you bring the family for a Christmas holiday in the sun, then send them home before the rally starts. My husband and I have decided to do this!!!! We are having great difficulty in getting cooperation LOL any help in helping us plan would be greatly appreciated…. We are going!!!!! LOL we have met a few others who are going as well, my husband wont be able to ride this year (surgery from the last Baja Rally lol) but we are looking to rent a 4×4 truck or suv and are just going to go for it 🙂 I just read the article, and we will plan on taking your advice.